VIDEO FOR CATS TO WATCH: Black Birds and Squirrels. 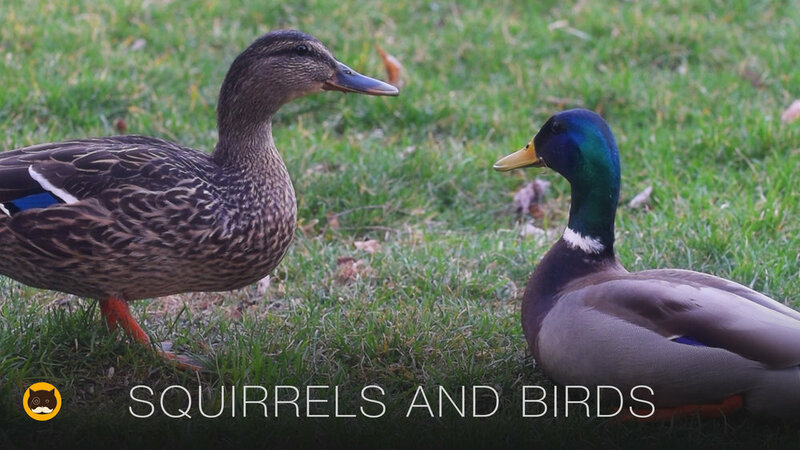 Birds and squirrels feeding on the ground with plenty of action for your cat's enjoyment. Birds filmed include the common grackle, winged blackbirds, sparrows, morning doves, and squirrels. Watch the full length video and get access to many more by subscribing to TVBINI Premium Membership. Posted on December 18, 2017 by TV BINI and filed under Bird Videos, Video for Dogs and tagged black birds squirrel video for cats cat tv video for cats video for dogs video for cats to watch tv for pets tv for cats movie for cats tv channel for cats to watch videos for cats bird video for cats birds video birds for cats cat games cat games on screen cat games birds cat games online cat games for cats movies for cats videos for cats to watch squirrels videos for cats birds video to entertain cats. VIDEO FOR CATS TO WATCH: Winter Birds #9. Bird Video for Cats - Mourning Dove. Bigger birds like doves, and smaller birds like sparrows and house finches, chickadee, and dark-eyed junco feed together on the ground with plenty of movement and action for your cat. Watch the full length video and get access to many more by subscribing to TVBINI Premium Membership. Posted on July 15, 2017 by TV BINI and filed under Bird Videos, Winter Bird Videos and tagged birds video birds for cats bird video for cats videos for cats video for cats video for cats to watch tv for cats movie for cats winter birds mourning dove cat games cat games birds cat games online cat games for cats cat games on screen cat entertainment cat entertainment video. CAT GAMES - LOVEBIRD! Video for Cats to Watch. Posted on April 19, 2017 by TV BINI and filed under Bird Videos, Animated Videos and tagged videos for cats video for cats video for cats to watch tv channel for cats to watch tv for cats movie for cats catching birds pet tv cat entertainment cat games cat games on screen cat games birds cat games online cat games for cats games for cats to play games for cats lovebird cat tv. VIDEO FOR CATS TO WATCH: Winter Birds #8. Bird Video for Cats. Posted on March 28, 2017 by TV BINI and filed under Bird Videos, Winter Bird Videos and tagged birds video birds for cats bird video for cats website to entertain cats garden birds winter birds videos for cats video for cats video for cats to watch tv for cats tv channel for cats to watch movie for cats cat tv games for cats games for cats to play Northern Cardinal entertainment for cats. VIDEO FOR CATS TO WATCH: Winter Birds #7 - N.Cardinal, Sparrows, Finches. Posted on March 14, 2017 by TV BINI and filed under Winter Bird Videos, Bird Videos and tagged videos for cats video for cats video for cats to watch tv for cats movie for cats tv channel for cats to watch cat tv catching birds birds video birds for cats bird video for cats Northern Cardinal sparrows website to entertain cats. CAT TV - Night Birds. Bird Video for Cats to Watch. Posted on February 5, 2017 by TV BINI and filed under Bird Videos and tagged birds video birds for cats bird feeder bird video for cats videos for cats video for cats video for cats to watch tv channel for cats to watch tv for cats movie for cats cat tv entertainment for cats pet tv games for cats garden birds free video for cats to watch. MOVIE FOR CATS - Garden Birds #7. Bird Video for Cats. Posted on February 2, 2017 by TV BINI and filed under Bird Videos and tagged videos for cats video for cats video for cats to watch tv channel for cats to watch tv for cats movie for cats birds for cats bird feeder birds video website to entertain cats bird video for cats cat entertainment entertainment for cats cat tv pet tv cat games cat games for cats games for cats to play garden birds games for cats. Posted on January 11, 2017 by TV BINI and filed under Bird Videos and tagged birds video birds for cats black birds bird feeder bird video for cats website to entertain cats videos for cats video for cats video for cats to watch tv channel for cats to watch movie for cats tv for cats cat tv entertainment for cats screensaver for cats pet tv.